Do you feel that …. You lack confidence when you speak English and you fear making mistakes? You have problems understanding native speakers and different accents including English in films, TV programmes, videos etc? You repeat the same basic vocabulary and can’t use advanced vocabulary such as phrasal verbs and idiomatic expressions? People don’t understand you very well when you speak English because of bad pronunciation, and you don’t know how to improve it? You don’t speak English fluently, you can’t express yourself clearly and often stop and hesitate when you speak? What if we could help you? Imagine using native like vocabulary such as phrasal verbs and expressions during a conversation..
How would you feel if you could speak English fluently without stopping or hesitating? You can continue to learn English in the same way; lacking confidence, using the same old basic vocab, avoiding phrasal verbs and idioms, failing to understand others, looking for ways to improve pronunciation that simply aren’t effective and struggling to reach fluency. 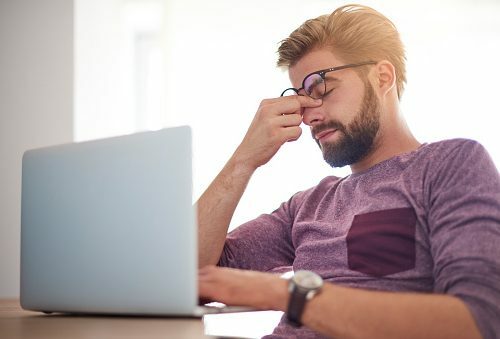 What if we told you that there was one course that covers all these problem areas in one place? We would like to present to you The English Skills Course where we solve all these problems! So if your tired of feeling frustrated and not making much progress with your English then this course is guaranteed to help you. You can try and test some of our incredible methods in the preview course absolutely FREE! 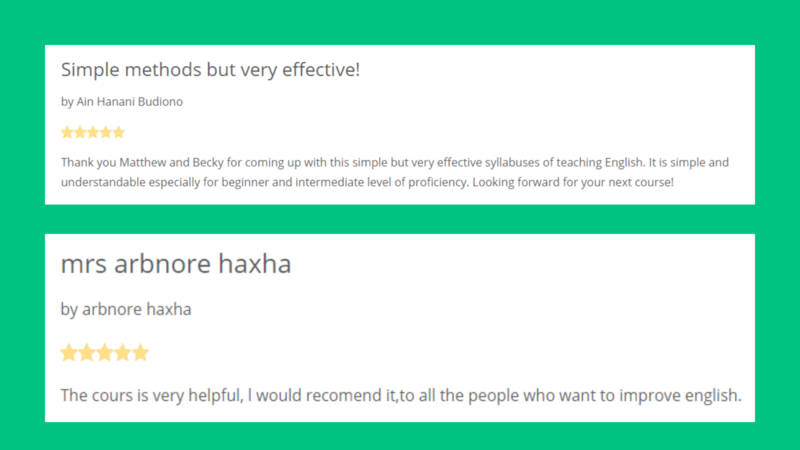 You can try the best lessons related to each skill within the course so that you can start improving your English skills right now! PLUS…you’ll also get our incredible FREE eBook as well as access to our English Skills Community. Each module focuses on one skill; personal, reading, listening, vocabulary, pronunciation and fluency so that you can master each one! These expert methods will change the way you learn English forever! You can finally take control of your own learning and really MASTER the English language! ✔️Get access to over 50 video lessons teaching you these incredible methods. ✔️Reinforce what we teach you with our handy downloadable lesson materials for each individual module. ✔️Practice the methods using the practical tasks. ✔️Check your understanding with the interactive quizzes. ✔️Get online teacher support throughout the course from native English teachers. Teacher support from native teachers - Matthew & Becky. Accesses to NEW video lessons and activities. External links to useful websites and resources. FOREVER…there is no limited access! 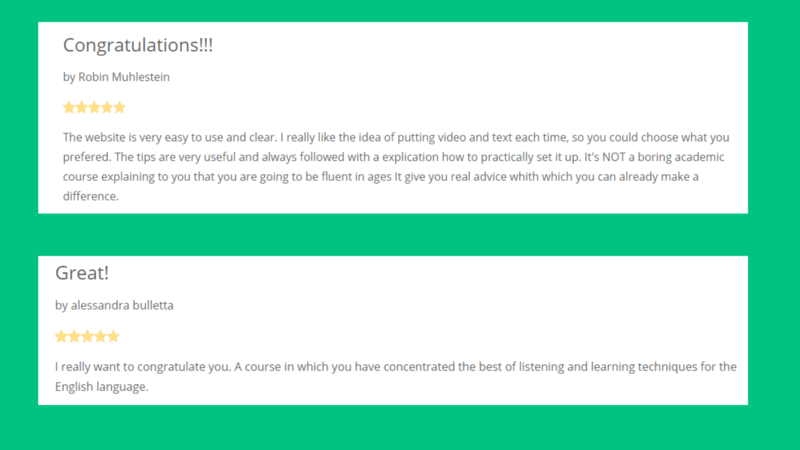 You will have lifetime access to all the video lessons, tasks, PDF’s, eBooks, the private English community everything. Plus any updates to the course and new lessons! You’ll learn how to improve your English skills. We’ll teach you useful methods to take your English to the next level. We focus on 6 different skills in the course; personal, reading, listening, vocabulary, pronunciation and fluency. WILL I SPEAK FLUENTLY AFTER I TAKE THE COURSE? There is a full module on how to improve your fluency. You’ll learn some fantastic techniques so that you can practice and improve your fluency. It all depends on you and how much effort you put into practising the techniques we teach you. Fluency improves with practice – the more practice the better you’ll become! WILL I HAVE ONE-TO-ONE CLASSES WITH A NATIVE? No, not in the course. The course is an e-learning course so all video lessons have been pre-recorded so that you can access them whenever and wherever you like. The amount of tips, advice and amazing methods that you'll get in our English Skills Master Course is beyond any other course out there! Whether you want to improve your English for work, travel, an exam or just for personal development the investment is completely worth it! That's why we are confident to offer you a 30-day satisfaction guarantee. If you're not satisfied, we don't expect you to pay - just send us an email and we'll happily return the payment. You're completely covered! So, what are you waiting for? Sign up and get INSTANT ACCESS to these incredible lessons!!! Here at Online English Skills, we show you what you need to do to improve the most important skills within the language. We hope that we can help you with your learning journey! End of Module 1 Quiz: How much do you remember? End of Module 2 Quiz. How much have you learned? Collocations in Use - Intermediate PDF Download.